If you are considering web application development, it is important to know what a web app is, how it differs from a website, and the steps vital to successful development. The primary difference between a website and a web app is that a website has static content and a web application must have dynamic content. A web application can access a database and deliver results in real time. The main purpose of a website is to inform, and the main purpose of a web application is to do. A custom web application can serve a variety of business needs and functions. In a world of ever-increasing mobile apps, is web app development still useful? Over the past few years, demand for web applications has surged, as they are more crucial to businesses now more than ever. Web apps are essential for improving communication and efficiency, whether the company is big or small. Most day-to-day functions for a business are still done from a desktop or laptop computer -- making web apps especially valuable to businesses who want to improve efficiency and organization. 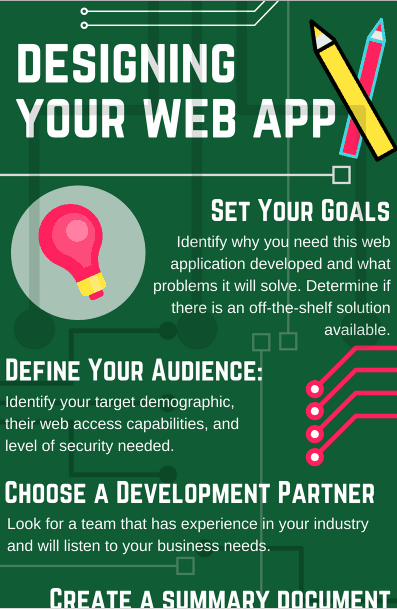 This infographic by Enola Labs will help you to learn more about the web application development process and what to expect each step of the way.